Sign up for a coaching call with Steven. We’ve seen a spike in April 2019 with catalog detail pages being removed from Amazon. We predict an Amazon algorithm update occurred to removed detail pages from Amazon. Is your IP address used on any other seller central accounts? Is your bank account used on any other seller central accounts? Is your email address tied to other Amazon accounts? Is your cell phone used in the 2 step verification tied to any other Amazon accounts? If the answer to the above 1-4 is yes, write to seller-performance@amazon.com and ask for reinstatement of your account, and state that you are unsure of the reason it was suspended but that it may be because you have logged into another person’s account. State that you do not have multiple accounts. Do you sell on any other Amazon accounts? If yes, request approval from Amazon by emailing seller-performance@amazon.com to sell on multiple accounts and share that each has their own business structures, unique banks, and unique items. 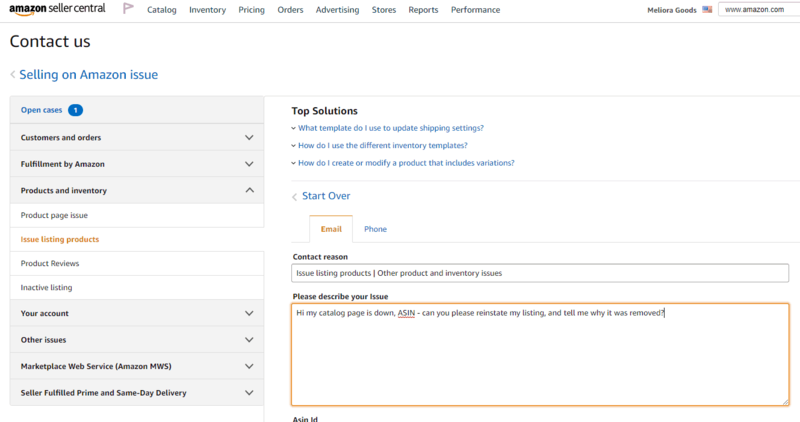 If the answer is no the above, you should write seller-performance@amazon.com and ask why the suspension occurred. Also call Amazon seller support and ask, they may be able to tell you. It will take 14 days on average to fix the suspension. Email every 2-3 days requesting an update and restating your position. Within the first response from Amazon you will get an automated email that won’t make sense, keep emailing. MyAmazonGuy charges by the hour and usually can help with suspensions for $500 total cost. However you may find it in your best interest to try the above advice first. If you want to hire us though contact us here: let me know.